It wouldn’t really be a transfer window without Khouma Babacar being on the verge of joining Crystal Palace. The striker, who signed for Sassuolo on loan in January (made permanent this summer), was repeatedly linked with a move to the Premier League club whilst at Fiorentina. 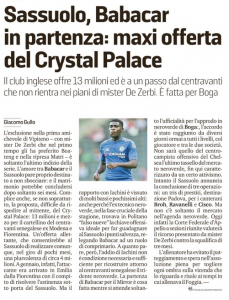 In April, we suggested that Palace may have dodged a transfer bullet, as Gazzetta dello Sport reported on the player’s struggles at his new club, with the Italian newspaper dubbing him a ‘ghost in the box’. He scored two goals for Sassuolo after the move, and the last of those came in March against SPAL. The club’s local newspaper Gazzetta di Modena report that Babacar is ‘one step away’ from joining Crystal Palace because a ‘maxi offer’ offer of €13m is just too good to turn down, and would give them an immediate profit of around €4m. It’s not entirely clear why Crystal Palace are continuing to chase the striker, given they could have got him cheaper in January and he hasn’t exactly impressed since. These claims started in England and they’ve clearly been welcomed in Italy.